Jimmy Takter’s brilliant mind has produced a brilliant career as one of the best trainers in harness racing history. So, why is he walking away at age 58? On Dec. 1, perhaps the greatest trainer in harness racing history will retire. In Part 1, we examine what makes him tick, his Zen-like connection with horses and why he’s walking away at the top of the game. Under battleship gray skies, a squadron of geese is bugging out over rust-dusted trees. A chilling November wind indicates a sea change, but, for the moment, Jimmy Takter is passively sitting in a jog cart, waiting on Tactical Landing to decide when it is time for work. “If you’re not patient in this game you’re never going to make it as a trainer,” Takter said as the majestic trotter stood statue still for the better part of 10 minutes on the path to the track, staring at God knows what in the vast panoramic at Takter’s Hightstown, NJ private equine heaven. It is exactly one week since Tactical Landing’s Breeders Crown victory added another chapter to Takter’s thick tome of accomplishments, but the trainer is counting the days forward, not backward. Dave Landry | Takter said about three years ago he started to burn out on training horses. Dave Landry | Jimmy Takter on the track at home in July of this year. Claus Andersen | After working with horses for 50 years, Jimmy said it’s time to devote more of his life to his wife Christina (shown together after Muscle Massive won the 2010 Hambletonian). Dave Landry | Jimmy Takter said he’s excited to try new challenges when he retires one week from today. More than a year ago, Jimmy announced he would retire from training at the end of 2018 (full story here). The date he has circled on his mental calendar is Dec. 1. One week from today, one of the greatest trainers to ever sit behind a standardbred will wake up with no fixed plans for the first time in about 40 years. Skeptics, who should have learned long ago never to doubt anything Jimmy sets his mind to, should know he has already made an appointment for he and Christina to get their Global Entry cards to expedite the clearance process through customs and they have already booked flights to New Zealand for February with no return tickets. He is only 58, but horse racing years are not the same as normal years. The job, he said, is filled with incredible highs and lows and even a man that has accomplished as much as he has starts thinking he’s a terrible trainer when his horses don’t race well. “That’s how the game is,” Jimmy said. On this night, his horses were racing poorly at Hoosier Park and the Meadowlands. Neither the wine, nor the fact he and Christina are watching from their cozy American room — everything in it festooned in red, white and blue to celebrate their deep love of their adopted country — did much to soothe the blow to his ego. Losing gnaws at his soul, even with 33 perfectly displayed and illuminated Breeders Crown trainer trophies on a high wall nearby — with one more to be added soon. About two or three years ago, Jimmy said he started feeling burned out. Though he still had his usual red-hot motivation to win every time out, the highs weren’t as high. “It just became a job,” he said. A man known for his youthful energy started to look tired and — as Jimmy is fond of punctuating his sentences — “bap-bap-bap” he was determined to do something else with his life while he still could. “I’ve had insomnia all my life. I have big problems sleeping,” Jimmy said, explaining that he can’t slow his mind down from trying to solve the latest horse problems. “My brain is going a million miles an hour all the time. You get tired. I can think about this and this and what I’m going to do with that — bap-bap-bap. He imitates the feeling with a bemused, glazed smile and eyes that slowly scan the room like a Felix the Cat clock. The next morning, Jimmy is doing what he has done thousands of mornings before. He makes the drive from his beautiful house to the barn he built directly behind it, parks in the spot marked “Mr. Takter” — adjacent to the one marked “Mrs. Takter”— and practically bounces into the barn. Walking the shedrows to visit his horses and staff is one of his favorite parts of his routine. “I’m good with animals and I love my animals. Horses for me are like a gift from God,” he said. One of his first stops is to visit Tactical Landing. He opens Tactical Landing’s stall and walks in. Not only did Tactical Landing cost $800,000 as a yearling, Jimmy said the full-brother to Mission Brief knows he’s special, despite a bumpy road getting to prominence. “That freakin’ horse knows he’s good,” Jimmy said, which is why he lets Tactical Landing take his own sweet time getting to the track. After all, the horse has been something of a personal project for the trainer since arriving in his barn in June after limited success elsewhere. Svensson tells the story of his own trainee Brind’Amour. When the trotter was returning to the races at three, something was wrong and Svensson was struggling to straighten Brind’Amour out. Svensson wanted Jimmy to try his hand with the horse, but was reluctant to ask. Perry Soderberg, another longtime friend and assistant — and the man that has picked out many of Jimmy’s champions — said Jimmy has an incredible ability to read horses. “When he sits behind horses, he gets a feeling for what’s going on with the horses and he starts to check them out. You can stand on the side and see nothing wrong, but he will feel that something is coming. He always checks them out before it goes bad. He does his own checking, has his acupuncture points. He does flexion on the joints. He checks everything. Conny works with the feet and they are on top of it before (something bad) happens,” Soderberg said. Through a full day’s worth of conversations, Jimmy remains remarkably humble, but this is one of only a handful of areas that he admits to having above-average ability. Jimmy’s top assistant, Per Engblom, said Jimmy excels at the fine details. “Are we going to push on or back off? Are we going to train hard today or train soft? That’s really what it comes down to with him. I can prepare everything for him and have everything ready, but that’s where, I think, we’ve been successful. I’ve been helping him to have everything prepared, ‘Here’s the training list… everything is organized’ and then he comes in and does his thing and that’s been great,” Engblom said. Owner Frank “The Elder” Antonacci said Jimmy has, “a great sixth sense about the horses.” Jimmy trained Moni Maker for Antonacci and his partners. When the trotting mare retired, she was the richest standardbred in the world with earnings of nearly $5.6 million. “He really understands the psyche of the horse. When he sees a problem with one horse and fixes it a certain way, he’s smart enough to understand that maybe that same change won’t work on another horse with a different mental capacity,” Antonacci said. This morning, on his tour of the shedrows, Jimmy stops in to visit Moni Maker’s son, International Moni. The trotter recently came into his operation. With that, he slaps International Moni’s neck enthusiastically and laughs. Jimmy said perhaps his favorite horse, ever, was world champion pacer Always B Miki — not because Miki set a 1:46 all-age world record, but more for the horse’s personality. The trainer used to go to the barn at night just to visit Miki. “Every night I walked into the stall to pat his head and I loved it,” he said. That deep and abiding love of horses didn’t come instantly. Though he was 7 or 8 when he began working with his father Bo’s horses 50 years ago back in Norrköping, Sweden, Jimmy said he was more enamoured with his father’s used car business than the horses his father trained. Jimmy didn’t fall in love with horses until he made his first trip to the United States at age 17 and worked for Swedish legend Hakan Wallner. “I took care of a horse called Saint Francis and one named Keystone Patriot. When you take care of two horses, you become very attached to them,” Jimmy said. From that moment on, he was determined to be successful in the United States; all the while his mind was churning as he searched for angles to profit from his God-given talent to comprehend horses. How he would solve the puzzle and become one of the greatest trainers in history is the story of a powerful work ethic, a fearlessness to never stop changing and a business savvy worthy of a CEO. Jimmy Taker on making changes, structuring his training operation as a business, his increasing spirituality and what is next for him after he retires on Dec. 1. It isn’t always easy living in Jimmy Takter’s world. One of the challenges of dealing with the trainer’s brilliant, hyperactive mind is rolling with all the changes. Many times, Perry Soderberg — Takter’s longtime friend, former assistant and yearling-picking master — admits he has “freaked out” mentally when horses would win a major stakes race and Takter would change everything about their equipment and routine. “He’ll have a great year, win six Breeders Crowns, and change everything,” Soderberg said. “His thought process is energized. He needs to think about new things, likes to improve things. It’s how he is. 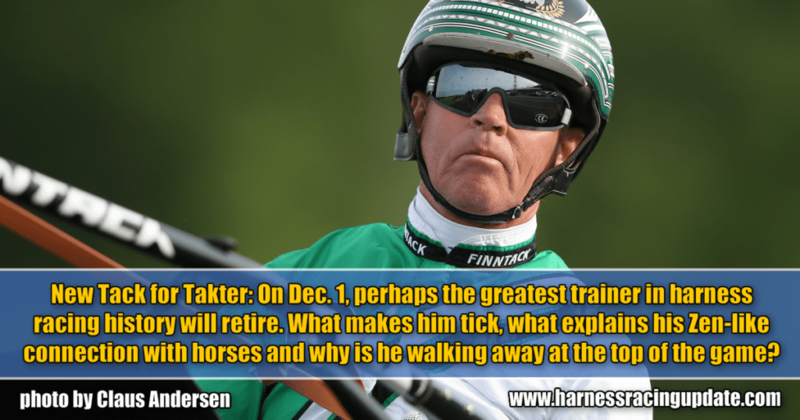 Claus Andersen | Takter is rarely satisfied and makes constant changes to keep horses sharp. Dave Landry | Jimmy’s top assistant, Per Engblom, will inherit the other half of Jimmy’s stable. Dave Briggs | Jimmy and Christina’s farm – with their home visible in the distance – will be the 2019 base for their daughter, Nancy Johansson and Jimmy’s top assistant Per Engblom. Dave Landry | No matter what happens next, Jimmy Takter (with Perry Soderberg, left, and Christina at the Lexington Sale in 2017) will be impossible to replace. Claus Andersen | In 2010, father and daughter shared a Hambletonian victory with Muscle Massive. Now, Jimmy is turning over the reins of part of his operation to Nancy. Claus Andersen | Jimmy said he is looking forward to being a consultant next year. Dave Landry | In a week’s time, Jimmy Takter (shown waving goodbye in October at Red Mile) will retire as a trainer. Claus Andersen | Jimmy said he owes it to Christina to spend more time with her. The couple is shown after winning the 2008 Jugette. Dave Landry | Despite achieving more than perhaps any trainer in history in his Hall of Fame career, Jimmy said losing still gnaws at his soul. Today, Soderberg can shrug about it. Takter’s unparalleled success long ago earned the trainer the benefit of the doubt. “I think he wants the horses to think about where they are putting their feet all the time, going forward, not just going like zombies straight forward. It’s got to be the right combination, the mental thing. I get nervous every time, ‘Why did you change this?’ but then it turns out to be even better,” Soderberg said. Adapting to Takter’s decision to retire on Dec. 1 at age 58 is no different. Some people are struggling to understand, others are skeptical. Takter just wants a change — something he said is both inevitable and necessary. “You’ve got to change… I change everything,” he said emphatically, explaining that, when it comes to horses, you simply can’t train them in 2018 the way you did in 1980 and hope to have success. As for going against conventional wisdom and advice, Frank “The Elder” Antonacci, one of Moni Maker’s owners, said the reality is Takter has considerable strength of conviction… and stubbornness. Takter uses the straight track on his 100-acre farm as an example of his fixation with change. Takter said it is all about helping his owners — most of whom are dear friends — recoup as much money from their investment as possible. It also explains why he has decided to transition into being a consultant overseeing his clients’ investment in horses. Though Takter is retiring from training next weekend, many of his owners are staying in the operation he built. Most of the horses are being split between his daughter, Nancy Johansson, and his top assistant trainer, Per Engblom. Both trainers will work out of Jimmy’s farm. “(My owners) got very excited when I said this is what I want to do, that I want to be involved for Nancy and Per. I want to see them do well. I’m not going to interfere and tell them what to do. I want them to be independent, but, by the same token, I’m going to come in and if I see a horse that my clients own is on the wrong track and not doing well, bap-bap-bap I can say, ‘Nancy, I think you should give that one to Per’ or the other way around and see if we make progress,” Takter said. It’s one of many examples that Takter truly cares about the people in his life and wants them all to succeed. Takter said not everyone sees the compassionate side of his personality. “People don’t know me,” he said. “Mostly when people see me, they see me at the racetrack. At the racetrack, I’m not the same guy. I’m more serious… Maybe people think, ‘That guy’s cocky.’ I’m not, actually. I’m totally opposite. I’m more caring. But I always say what I think and a lot of times that backfires, too. “Harness racing is a competitive business. Maybe they have a little jealousy, but when it comes down to it, really, we’re a little family. You saw what happened with that (barn fire) disaster up in Canada. People are really very good in harness racing to stick together. Nobody wishes any bad, really. Maybe they’re happy that I’m (retiring) bap-bap-bap. There’s always some people that want to see me and (fellow top trainer Ron) Burke get a positive, or are wishing us bad luck. But when it comes down to it, really, that’s not what they’re wishing for. It’s just that they want to get you out of the competition. This partly explains the genesis of a daily inspirational message Takter started sending out to his friends via text about three months ago. “All my owners are on my daily quote list. They get a text every day,” Takter said, adding that the list is growing. “I write about half of them and some I get back from people that are on my list and I reuse them. All of the ones I send come from how I feel that day. I do this because we all need support in our lives and we get stronger together. With that, he recommends a book that really spoke to his creative mind. These days, doing good things for other people makes Takter happy. Sometimes, he’s a bit like a mother hen — refusing to take no for an answer, as is his wont. Like the time he insisted a visitor that struggled with a horse allergy try Flonase nasal spray and then drove that person to the local pharmacy and insisted they go across the street to buy some. Trying to do the right thing matters deeply to the man. When he was given Always B Miki to train, Takter asked to buy a share of the horse, but was told only a five per cent piece was available and the cost was $80,000. He agreed to buy the share without telling his wife, Christina, who looks after the stable’s books. About a week later, Always B Miki broke down for the second time in his career. Jimmy was training the pacer on his sand track when he felt something give way with a whap! Instantly, Always B Miki had a foot in the air. “It’s the worst feeling in the world when a horse breaks down, especially when they break a bone like that. I saw the pain in the horse’s eye… and I was standing there holding him. I started walking him and he started walking on three legs. It was heart-breaking,” Jimmy said. They rushed Always B Miki to equine surgeon Dr. Patty Hogan, who operated and put four screws in the pacer’s leg. But there was still the issue of Jimmy’s ownership share in the horse. The trainer had not sent a check prior to Miki breaking down, but didn’t think about backing out of the deal even though the situation looked dire. Always B Miki not only recovered, he went on to record the fastest mile in the history of harness racing, a 1:46 performance in October of 2016 at Red Mile en route to the Horse of the Year Award and a stallion career. “See how karma works when you do the right thing? The horse made that money back, plus,” Jimmy said, smiling. Always B Miki is one of about 50 stallions, worldwide, that Jimmy said he has helped create in his career. Soderberg confirmed the number. Though creating some 50 stallions would be impressive enough for one trainer, Jimmy said the statistic he is most proud of is the one in which his horses have earned more than $13,000 per start over 26 years (ever since trainer stats were first kept in 1991). “I’ve been extremely consistent for the last 25 years. Everybody can get good horses and have a good year and bap-bap-bap, but we’ve been very consistent,” he said. Through Nov. 22 — and remember, the eight years between 1983, when he started training, and 1991, when they started keeping trainer records, are not accounted for — Jimmy is credited with 9,956 starts, 2,154 wins and earnings of $129,769,939. As a driver, he has won 822 of 4,368 starts and posted earnings of $24,445,651 in 35 years in the sulky. Assembling a crack team — Christina, Svensson, Soderberg, Engblom, Johansson and many talented caretakers — has been key to his success. In his blacksmith shop in the main barn, Svensson proudly shows off a photo of Team Takter in 1993 — six caretakers, plus Jimmy and Christina. “When I first started shoeing for Jimmy, Perry (Soderberg) was working for Jimmy helping in the barn for a little while,” Svensson said. “We didn’t have a big stable when we started. I think the first year I worked for Jimmy we had 11 babies, but that was a good group of babies. There was Mr Lavec, Gleam, Whiteland Image, Do It With Style. Ten years earlier, when Jimmy started out on his own, it wasn’t as glamorous. Soderberg was along for the ride and he remembers Jimmy’s first horse was a pacer that won something like 26 or 27 races that was key to supporting Jimmy’s young family. Jimmy soon learned that it was best to hire Soderberg to inspect yearlings — the first horse he told Jimmy to buy was Gleam — and leave Svensson to work his magic with horses’ shoes. One of those times, Svensson was asked to save the day with Kadabra when the trotter went lame just before heading off to check into the detention barn at the Meadowlands for a major stakes race. “They called and said, ‘He’s dead lame. What are we going to do?’ They were all ready to load their horses and there were lots of people around. Jimmy just told them, ‘Hey, leave Svensson alone.’ He looked at me and said, ‘You fix him’ and then he left. He just said ‘fix him, do the best you can’ and then he walked away. It felt like he trusted my judgment on it. I did the best I could and it worked out, so that’s one really good memory,” Svensson said, smiling. Caretakers are just as important, of course. Jimmy said he’s been lucky to have many talented ones, but few, if any, can equal the work of Anette Zackrisson, a 10-year veteran at Takter Stables whom Jimmy calls the best caretaker in the business. “She is the best. There is nobody better… Her horses are her babies,” Jimmy said. Strolling through his shedrow on his morning rounds, Jimmy kids with Zackrisson about where her new horses will be located — either in the main inside barn or one of the outdoor shedrows. “I know Anette doesn’t like to be outside,” he said. “No, I want my horses inside and I want my corner. That’s it,” Zackrisson said, matter-of-factly. Zackrisson rolled her eyes and walked away. Outside, Greg Harrison — son of trainer Kelvin Harrison — is singing Elvis tunes while doing his work. “Nothing wrong with a little Elvis in the morning,” Greg said with a big goofy grin. In the barn entrance way, blankets celebrating victories in the Hambletonian, Jug, World Trotting Derby — and one celebrating Always B Miki’s retirement — are displayed on railings. The horse statue in front of Jimmy and Christina’s house — the one that always touts the latest Team Takter triumph — is covered with Tactical Landing’s Breeders Crown blanket that is rippling in a stiff breeze. There’s no horse photos in his house, but in the barn office, framed photos of Jimmy’s many champions hang on the wall. Technically, it is Christina that is the owner. But since they share everything, Jimmy said the arrangement has been an essential part of the operation. Keeping in mind that Jimmy is just the second trainer in history to reach $100 million. Jimmy said he gets both his business savvy and training acumen from his father, Bo. “He was a businessman. He sold cars. He sold everything. He was a real hustler,” Jimmy said. When Bo was 27, he fell in love with horse racing on his first visit to Stockholm’s famed Solvalla Racetrack. At that moment, Bo had an epiphany. This is what he wanted to do with his life. Not long after, when Mantorp Race Track opened near where the Takters lived in Norrköping, Bo enthusiastically jumped into the horse racing business. When Jimmy was 7 or 8, the family moved to a small farm. The hours both before and after school, and on weekends, were consumed with working in the barn. Meanwhile, Bo, a fitness nut, kept a scale in the family living room and every day had Jimmy and his brother, top European driver Johnny Takter, weigh in to make sure they were staying fit, too. Though Jimmy rose to become one of the top trainers in the world and his brother one of the best drivers on the planet, Jimmy said Bo never told them how proud he was. Now the legacy falls, partly, to the next generation. Johansson is slated to train 23 babies this winter, while Engblom, Jimmy’s main assistant, will get an equal number. “We’ve been doing so well for so many years and now it’s going to be a bit turned upside down, but with Jimmy’s help and the owners’ support, I think we’re going to do pretty okay,” said Engblom, who has worked off and on for Jimmy for 11 years, including the last six. Jimmy said he is already looking forward to May when he will personally oversee both operations for the month. He said working with the babies is his favorite time of year. Svensson said he expects both Engblom and Johansson to do well. Some suggest Jimmy is just too talented, too successful and too young to be retired from training for long. Yet, on a bit of test run last January he took the entire month off and spent it in Florida with Christina and a magical thing happened. His hyperactive brain needed no medication to quiet it. But, long term, Jimmy said he’s not sure how he will fare. For now, Jimmy Takter is embracing retirement with all of his energy and spirituality. NEW ROLE IN THE SPORT? He insists he is not walking away from harness racing entirely. Reid laughed when he heard that line, but not because he doesn’t think Jimmy is up to the task of making a positive impact on the sport in a different way. “He’s not short on self-confidence. He’s not short on salesmanship, so if he’s the CEO of Goldman Sachs in five years, I won’t be surprised,” Reid said. “He’s a great ambassador for the sport. Between (John) Campbell and him, they could probably talk anybody into doing anything,” Antonacci said. Meanwhile, those that know Jimmy best are happy for him. When you get right down to it, Jimmy said retirement is more about Christina than himself. “She’s a wonderful person,” he said of the woman he fell in love with when they were just teenagers in Sweden and Christina worked every other weekend at a grocery store to afford the train ticket to come visit him. Christina smiles sweetly at the memory, though it’s a lifetime ago. Just a week earlier, the morning after winning the Breeders Crown with Tactical Landing, her husband was more fixated on the Crowns he didn’t win with the 13 other horses he had entered. “I care and I felt like s— over it and I said to myself, ‘Can you imagine waking up and just worrying about what you’re going to have for breakfast?’ How nice and relaxed that’s got to be. It takes a special woman to be my wife and put up with it. For the man with the creative mind that is always racing, always changing, never satisfied, this is one thing he knows for sure.